After being rained out Saturday, Engine Pro Sprints On Dirt presented by ARP headlined the first-ever race on Fort Wayne, Indian’s Baer Field Motorsports Park new dirt track on Sunday night for the first race of SOD’s MAHLE/Clevite Beyond KLimits Challenge five-race series. Numerous facts about the event make it a truly historical event for both Baer Field Motorsports Park and Sprints On Dirt. The track crew put out a massive effort to make sure the Sunday race could take place. Several inches of rain resulted in the track being referred to as “Baer Lake” Sunday morning, then more rain came. The infield was pumped out and against all odds, the track was prepped for racing. Promoter Dave Muzzillo could have easily thrown in the towel, but was determined to get the race in. Thirteen-year-old Andrew Scheid, SOD sprint car rookie of the year contender, raced a full-size sprint for the first time and drew many compliments. After qualifying seventh in his heat group, Scheid finished last in his heat. 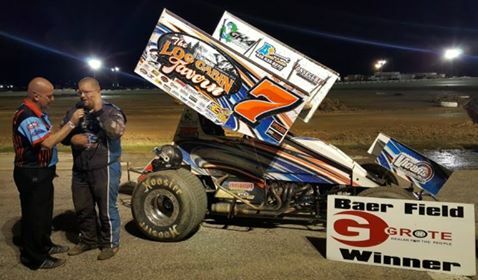 He then grabbed a fourth in the B Main to advance to the feature where he finished eighteenth, dropping out early in consideration of the fast field. Andrew dodged a few incidents that developed in front of him. He even executed a successful 360 degree spin to avoid a car that had spun to a stop in front of him. Scheid has extensive racing experience and numerous wins in karts and lightning sprints. The SOD “beyond limits” format continues to have broad appeal for race teams from many segments of sprint car racing. Winner Valenti and Dan McCarron are currently regulars in the 410 class at Attica Raceway Park and Fremont Speedway. Valenti has has had great success in thunderstocks and dirt trucks in Ohio and Indiana. 2nd-place finisher Joe Swanson, 5th place Steve Irwin, and 6th place Brad Wyatt have had success in winged sprint pavement racing. 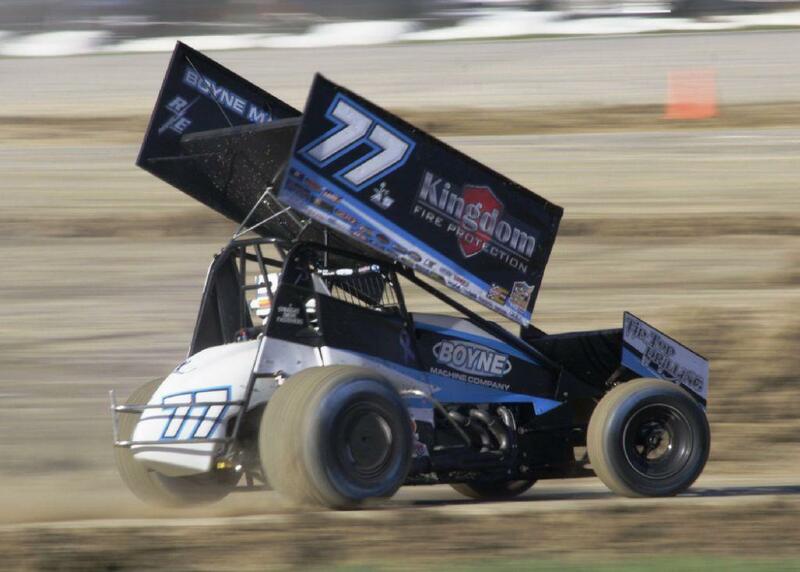 Irwin has won pavement championships and #71H car owner Steve Smith has also won pavement championships as an owner. 3rd place Landon Simon is a successful USAC competitor who ran his first winged sprint race Sunday. Irwin and Wyatt also have extensive non-wing experience. 4th place Thomas Schinderle previously raced modifieds, then was a regular in the Attica/Fremont FAST 305 class. SOD rookie announcer Matt Prieur got his first SOD race in Sunday. The former World of Outlaws late model announcer is also the announcer for the American Ethanol Late Model Tour, the American Ethanol Modified Tour, and occasional pavement races. Prieur has been a hockey referee for 24 years. He has also been the color commentator for an Ontario Hockey League game. Prieur has been announcing since 1989. SOD competitors got their first look at the MCRP safety crew. They were quick to assist in any on-track incidents. Engine Pro Sprints On Dirt presented by ARP is brought to you in 2017 by many important sponsor partners including: Engine Pro (Title Sponsor), ARP (Title Sponsor), Hoosier Racing Tire (Official SOD Tire), MAHLE/Clevite (Beyond Limits Challenge Sponsor), Driven Racing Oil (Battlegrounds Bash Sponsor), King Engine Bearings (King of Michigan Sponsor), Lane Automotive/MSD Ignition (Fast Masters Sponsor), Engler Machine & Tool (Heat Race Sponsor), COMP Cams (Heat Race Sponsor), RockAuto.com (Heat Race Sponsor), The Perfit Corporation (Lucky Dog Sponsor), KSE Racing Products, and XYZ Machining. In addition, SOD contingency sponsors include: Allstar Performance, ATL Racing Fuel Cells, BR Motorsports, Diversified Machine Inc. (DMI), K2W Precision/Keizer Aluminum Wheels, King Racing Products, Kistler Racing Products, Maxim Racing, Motor City Racing Promotions, Racing Optics, Rod End Supply, Schoenfeld Headers, Simpson Racing Products, Walker Performance Filtration. This entry was posted on May 23, 2017 at 8:38 am and is filed under Uncategorized. You can follow any responses to this entry through the RSS 2.0 feed.